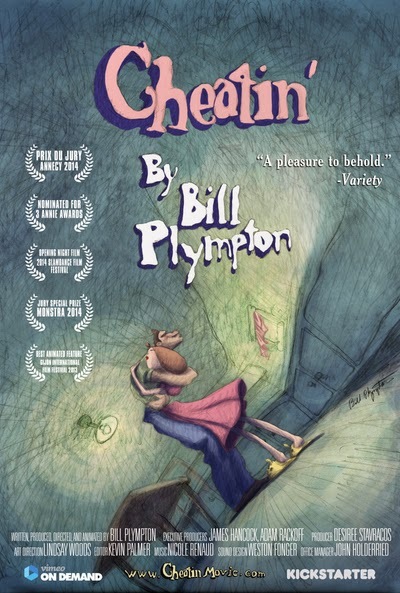 All you Kickstarter backers and Plympton fans will be delighted to learn that we finally have a release date for my latest feature film, CHEATIN'. Mark your calendars, because on April 3, CHEATIN' will have its U.S. theatrical premiere in NYC - then the next week it starts opening across America. We're planning to do a lot of press and personal appearances - in NYC we're going to have a star-studded premiere, and everyone who comes will get a free Bill Plympton sketch, and a few of the early attendees will get some prints or drawings from the film. As I travel around the country (like a rock star) making appearances, I also plan on giving out sketches to every member of the audience who wants one. We'll also have very cool posters and DVDs of my earlier films for sale. Below is a list of the opening dates around the country, and then a rough itinerary of my travels. Please tell your friends and everyone you know to come check out CHEATIN'! Keep checking back here, because we could book more dates, and my staff will keep the lists updated. We weren't able to get a big-time distributor for the film. Most of them believe there is no audience for an animated feature that's hand-drawn and made for adults. That's why I'm relying on YOU, my faithful fans, to show up and show them that they're wrong. Instead, we hired a booker to set up these screening dates and my rock-star tour. This is truly a new type of independent model for distribution, and I think this is really the format for the future. Often, even if a film is a big success, it never makes a profit, because money is siphoned off by agents, distributors and lawyers. We don't have any of those, so we have a greater chance of breaking even. In fact, in New York we decided to "four-wall" the film, that means we're basically renting the cinema for a week, but we get to keep all of the box office. It's very risky, and we could lose our investment if people don't show up. So, once again, we need the support of my faithful audience to help us get our money back. So please tell all of your friends, and even your enemies, to come see me and CHEATIN' when I come to your town. Check your local listings for showtimes + tickets. I hope to see you there! Too bad you won't be in Denver for the show, but I sure will be! Very excited.